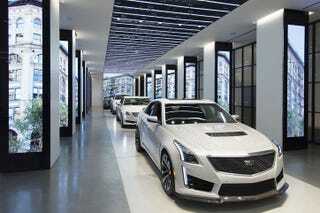 What do you all think of Cadillac’s new center for lifestyle and culture. It is open to the public, features coffee, has rotating Cadillacs, and finally will havea new line of fashion there ever quarter (yawn to that last bit). Is this cool or a desperate gimmick to regain sales? I think it is a tad dorky but I have no doubt that when I am in NYC I will have to visit it because Cadillacs lineup might be the best it has ever been.